Sean is a polite and energetic little three year old boy who lives in Washington, Illinois. Shortly after he was born, he was diagnosed with hypoplastic left heart syndrome, a disease in which parts of the left side of the heart do not develop completely. Sean's physical activity must be monitored and he must take medication to maintain his health. Sean's family is a source of amazing support and strength. When asked to reveal his most heartfelt wish, Sean wished to go to Disney World. This October, Sean and his family will be whisked away to Orlando to a special private villa at Give Kids the World Village, specially designed for kids with medical conditions. Sean is in store for an amazing time, including meeting Woody and Buzz Lightyear. The Uftring Auto Group was extremely proud to provide support to the Make a Wish Foundation and I Spy a Wish - and play a small part in helping Sean see his wish come true. On Friday, October 19th, Uftring Weston Chevy Cadillac welcomed Sean and his family to the dealership to participate in our Saturday Selldown and enjoy some cupcakes and smiles. It was a day we will remember for a long, long time. 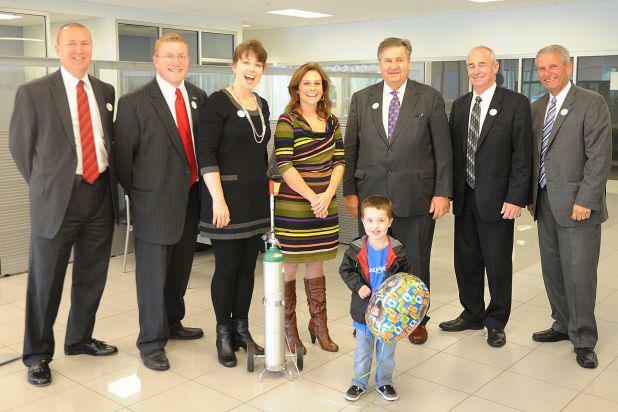 Members of the Uftring Auto Group team, with Sean and representatives of Make a Wish and I Spy A Wish.